It was apparent almost in the moment that Professor Linda Welters removed and unfolded the quilt tops from their locked storage drawer. Rachel May, then a Ph.D. candidate in English, knew she was looking at something extraordinary. First, the quilt was beautiful by any standard: expertly cut and hand-sewn, comprising vivid chintzes, ginghams, and calicos in hexagons of greens, red, and indigo, solids, and patterns of checks, stripes, and plaids. 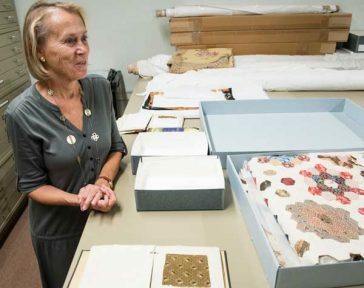 Welters handled the unfinished quilt like a nurse with a newborn, carefully separating it from the sheets of tissue paper set between folds to protect it from pressing against itself in storage. There were cotton fabrics in these pieces that dated back to the 1830s or ’40s. But it was the unfinished backing that required the most care. A hexagon quilt is named for the shapes that compose it. The quilter must cut countless hexagon shapes, baste fabric over each edge, and stitch them together, removing the paper backings only when done. 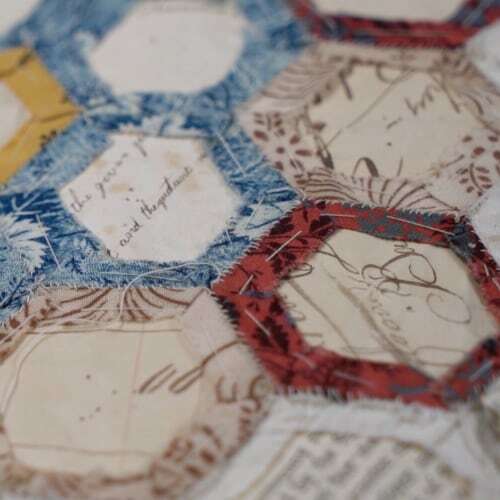 When Welters flipped the unfinished quilt pieces on their backs, May found that the “hexies,” the paper backings, were a historical treasure trove, some bearing handwritten words: friendship, sloop, schooner and “shuger,” “caske,” West Indies, Havana, and Barbados. On the back of that quilt, May would learn she was seeing the story of a slave-owning family told in scrap paper. May’s book An American Quilt: Unfolding a Story of Family and Slavery, published in 2018, is the result of more than seven years of research into the Williams-Crouch family—and the families they owned. A work of creative nonfiction, May’s book covers about 30 years, from the 1830s to the 1860s. An American Quilt is written in the first person—a choice May made so that the reader might experience the unfolding of the quilt’s story alongside her. It also allows the slave women to be central characters in the story, an otherwise near-impossible feat, given that the personal histories of the enslaved aren’t often recorded in enough detail for this type of book treatment. “I didn’t want to take that much liberty in telling their stories, and I wanted to find a way to include their stories,” May said. The URI Textile and Costume Collection, located in Quinn Hall, is home to approximately 20,000 objects from around the world. To students who would want to do similar research, May, now an assistant professor at Northern Michigan University, says first take advantage of the breadth and variety of courses offered at URI. And recognize learning is never over. The research and writing of the book have had a profound effect on May’s life. She writes in American Quilt: “I no longer see this country, these fabrics, the stories of the world around me, in the same way. I dive back into all the gaps in my knowledge of history, eager to listen, read, and learn more.